This week we’re joined by Linet, or Le Damsel Sauvage. She’s an honest one, feisty, full of truth, honour, knowledge, determination and when she is able, full of healing. Linet comes to Arthur’s court seeking assistance to help free her sister, Lionors. The only available knight though, was Beaumains (Gareth in his kitchen knave disguise). Linet mocks him, but she slowly recognises his character and finally, likes him. Linet comes across as an angry young woman. But the land at that time was quite hostile, unfriendly and if you weren’t ruthless, or at least able to hold your own, you were toast. So to speak. Linet is good at challenging us, as all the characters of Camelot are. She asks why do we undertake this journey? If you’re seeking something, Linet is quite good at finding it, whatever and wherever it is. She has quite a sharp tongue (Queen of Swords, anyone?) and strong determination. She’s certainly got a fire in her stomach and I’m sure that dagger at her side is wielded as often, if not as much, as her tongue. However, you never have to worry about where you stand with her, she certainly has a no-nonsense approach. She’s self-assured, highly practical and beyond determined. She was also gifted in the arts of healing, having created various salves etc. to heal herself and others when out on adventures. Linet’s good side obviously appeals to some, for she marries Gaheris, Gareth’s brother later on. So, what are you determined to do this week? What honour do you need to uphold? What battles do you need undertake, either internally or externally? What do you need to have determination about? Whatever they are, Linet can assist. 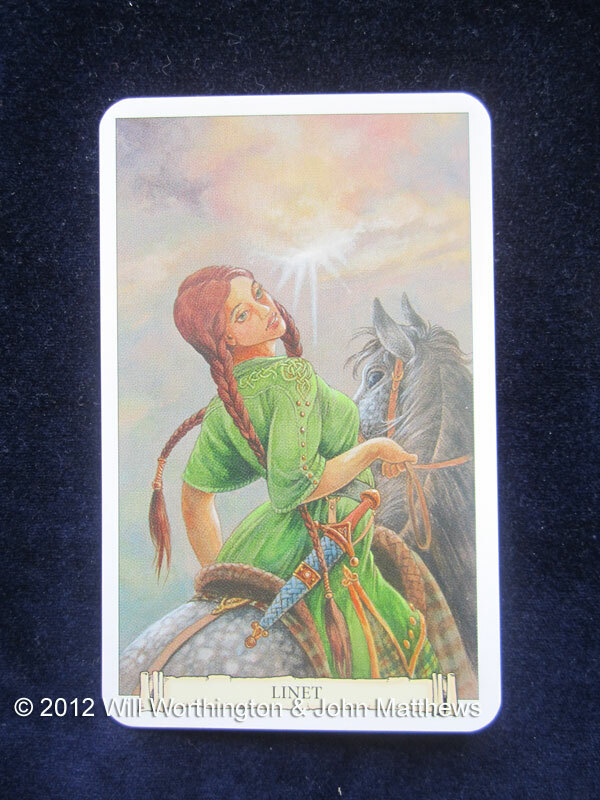 Tarot Blog Hop : Lammas ~ What Can I Share?